Rules determine automated system behaviour governed either by other events or based upon the predefined frequency. Example: When a new ticket is created and the Subject field contains “ASAP” acronym or other keywords or phrases implying urgency, the priority of a ticket should be automatically set to High to make sure it will be taken care at the earliest opportunity. 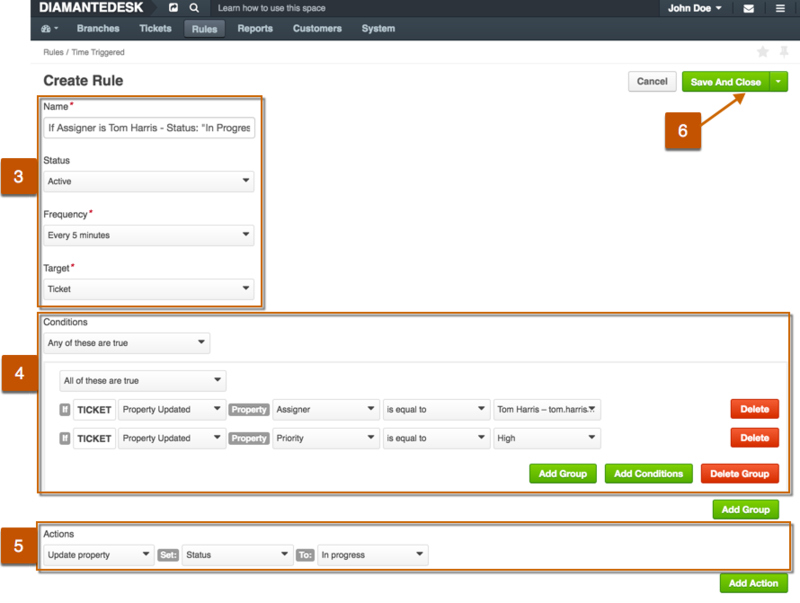 This helpful feature offers the ability to configure system behavior quickly and easily, without involving developers. Rules can be created / configured from the respective top menu item, shown in the picture below. This feature relays on system time-based job scheduler. Its required to add certain command to your system job scheduler, for example cron on UNIX-like systems. So please do not forget to configure this like described in installation chapter. Both types of these rules should have predefined Conditions and Dependent Actions, but the major difference between them is that in case of “event triggered rules”, the resulting action is performed right after one or several conditions are met, and with the “time triggered rules” conditions might be met, but the defined action is only going to be performed after the system “scans” after specified period of time. Each rule consists of Conditions and Dependent Actions. You are not limited to setting a rule with a single condition or single action. Instead, you are free to define complex conditions or group(s) of conditions and as many dependent actions as required. By specifying multiple conditions or groups of conditions, system behaviour may become remarkably automated and save time of your consultants. Time triggered rules can be applied to tickets only. 1) Go to Rules > Time Triggered. A list of All Time Triggered Rules previously created in the system opens. 2) At the top right corner click Create Time Triggered Rule. The Create Rule page opens. Name Define a meaningful name of the condition. We recommend mentioning conditions and actions in the name to avoid confusion. Status Define whether this rule should come into full force right after being saved. This setting is usually set to “Active” by default, but if you want to enable it later, choose “Inactive” from the drop-down list. Frequency Choose how often the system should be checked to find the tickets matching the specified conditions. 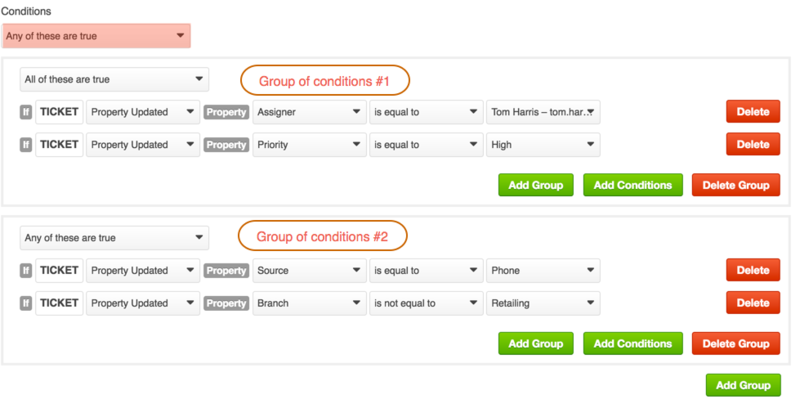 You may add several conditions or groups of conditions by clicking Add Conditions or Add Group, respectively. 5) Define the Actions which should follow if conditions are met. 6) At the top right corner of the screen click Save and Close. 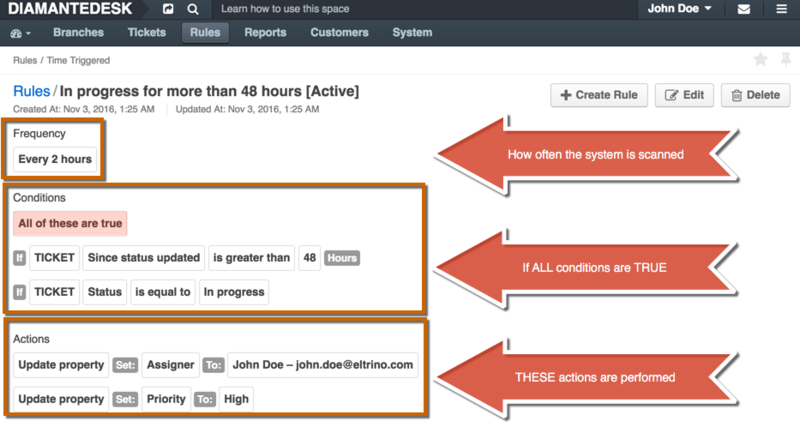 Event triggered rules can be applied to tickets and comments. 1) Go to Rules > Event Triggered. A list of All Time Event Rules previously created in the system opens. 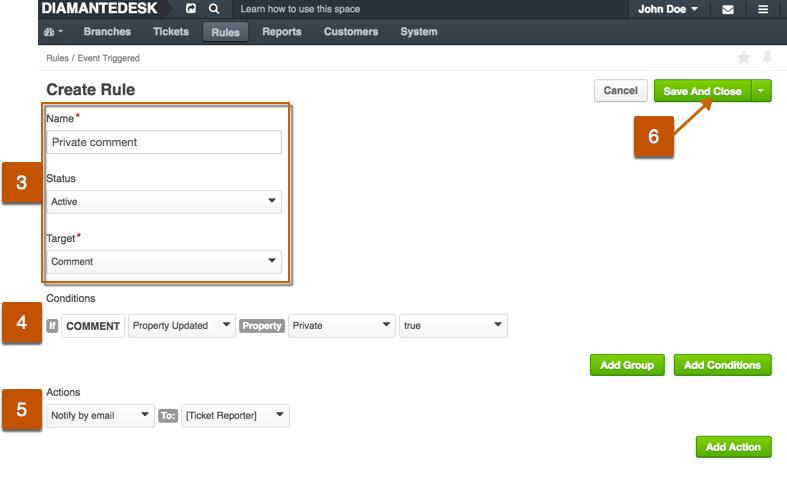 2) At the top right corner click Create Event Triggered Rule. The Create Rule page opens. If more than one condition or more than one group of condition is added, you should define whether All of these are true or Any of these are true.